From paw kneading to slow blinking, cats exhibit a variety of curious social behaviors that can seem pretty mysterious to humans. One such behavior that is particularly common is headbutting, or “bunting.” You might notice your cat headbutting your legs when you get home from work, or headbutting another one of their feline friends before curling up for a nap. You might even spot them rubbing their face against their favorite piece of furniture. So what’s this headbutting behavior all about? Is it just an attention-seeking mechanism? 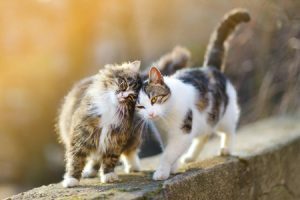 Although your cat may occasional bump up against you to get your attention, that’s not the only reason they like to headbutt. This behavior is also a bonding experience for cats, as it allows them to deposit their scent on their favorite people, animals and objects. By rubbing the scent glands in their face against familiar people and things in their environment, cats are able to establish a “group scent” that makes them feel more at home. When your cat headbutts you, they are conveying affection and marking you as a trusted member of their colony. Keep in mind that it is important to distinguish between headbutting from head pressing, however. Whereas headbutting is a normal, healthy social behavior, head pressing can be a symptom of serious neurological conditions. In contrast to headbutting, head pressing is characterized by a cat repeatedly pressing their head against a wall, piece of furniture or another inanimate object. It is also often accompanied by strange vocalizations and signs of disorientation. While headbutting is a welcome sign of feline affection, head pressing warrants a trip to the vet as soon as possible. Make More Feline Friends With These Tips! Does Your Cat Like to Run Around at Night? Here’s Why. Why Won’t My Cat Use Her Litter Box?